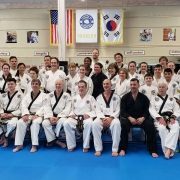 Asheville Sun Soo Martial Arts Had an Amazing April 2019 Testing Weekend and Grand Opening Celebration! We would like to thank Christine Priola, Publisher of Montford & North Asheville Neighbors, for sponsoring our April testing event. Each issue will feature a family local to the coverage area, and will highlight businesses that provide goods and services to people who live and work in Montford and North Asheville. Like Asheville Sun Soo, Ms. Priola is committed to building community and helping local businesses and families. We look forward to the growth of this partnership! Master James Marr is a 7th Degree black belt who, along with his wife Master Elaine Bayless, a 5th degree black belt, runs Master Marr’s Taekwondo in Shaker Heights, OH. Masters Marr and Bayless are both students of Grand Master Suk Jun Kim. Master John Meany is a 7th Degree black belt with over 25 years of experience practicing and teaching Taekwon-do. Master Meany is a student of Grand Master Suk Jun Kim in New York City. He and his wife, Master Laura Giletti, a 5th Degree black belt, run Glen Ridge Taekwondo in Montclair, NJ. Master Paul D’Ambrosio (Master D) is certified as a 7th Degree Master in the original traditional style of Taekwon-do, as well as a 4th Degree Master in Olympic sport Taekwondo. This uniquely qualifies him to teach to a very wide range of students, from the young Olympic hopeful to the more mature practitioner. He is the founder and primary instructor at Aliso Hills Taekwondo in Aliso Viejo, CA. Master Ethan Morris is a 4th Degree Black Belt, and hold the distinction of being the first student promoted to the rank of Master in Asheville Sun Soo Martial Arts. Master Ethan Morris is a senior at UNC Chapel Hill, and will be graduating with honors this year with a dual major in Economics and Spanish. 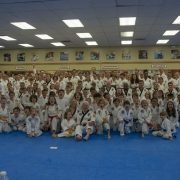 Also in attendance was Master Bob Kerr. We always appreciate his presence in our space, and while he did not sit on our panel, we would like to acknowledge his being here! The April testing also served as our Grand Opening Celebration. While not the first belt rank testing held in our current location at River Ridge Market Place, it was certainly the first in which we truly felt like we were settled in at our new home. We would like to acknowledge all the students who advanced in rank at this testing event. Special acknowledgment to (now) Grandmaster Tony Morris, who was awarded his 8th Degree during the April testing. Congratulations Sir! The following students tested for Black Belt Ranks during the June testing. Congratulations to all of you! https://www.martialartsasheville.com/wp-content/uploads/2019/04/20190413_114308.jpg 996 2048 Ms Smith https://www.martialartsasheville.com/wp-content/uploads/2017/07/Logo-Dark-Background-300x198.png Ms Smith2019-04-19 18:16:272019-04-19 18:16:27Asheville Sun Soo Martial Arts Had an Amazing April 2019 Testing Weekend and Grand Opening Celebration! Asheville Sun Soo Martial Arts would like to thank North Carolina-based First Bank for sponsoring our February 2019 Taekwondo Belt Rank Testing event. We’d like to give special thanks to Jarrod Perkins, a practicing student at Asheville Sun Soo, and local Branch Manager, for his coordination of this partnership. First Bank has been serving NC since 1935. They offer a complete array of banking products including mortgages, commercial loans, and insurance, as well as personal checking and savings accounts. There are 13 locations here in Western North Carolina, so please stop by and see what they have to offer! We’d like to additionally thank First Bank for providing some of the commercial financing for our relocation. They made the process easy and have been excellent partners in this endeavor. Thank you First Bank! Asheville Sun Soo Martial Arts Had a Great February 2019 Testing – The First in Our New Space!! https://www.martialartsasheville.com/wp-content/uploads/2018/09/20180818_172803.jpg 1536 2048 Ms Smith https://www.martialartsasheville.com/wp-content/uploads/2017/07/Logo-Dark-Background-300x198.png Ms Smith2019-02-20 12:19:442019-02-20 12:19:44Asheville Sun Soo Martial Arts Had a Great February 2019 Testing - The First in Our New Space!! Asheville Sun Soo Celebrates Our 12th Anniversary! https://www.martialartsasheville.com/wp-content/uploads/2019/01/20190102_185321.jpg 996 2048 Ms Smith https://www.martialartsasheville.com/wp-content/uploads/2017/07/Logo-Dark-Background-300x198.png Ms Smith2019-01-04 19:02:262019-01-05 12:02:46Asheville Sun Soo Celebrates Our 12th Anniversary! Asheville Sun Soo Relocating at the Beginning of 2019! https://www.martialartsasheville.com/wp-content/uploads/2017/07/Logo-Dark-Background-300x198.png 0 0 Ms Smith https://www.martialartsasheville.com/wp-content/uploads/2017/07/Logo-Dark-Background-300x198.png Ms Smith2018-10-26 11:07:342018-10-26 11:22:44Asheville Sun Soo Relocating at the Beginning of 2019! Please join us in welcoming Shihan Alex Ormaza to our August 2018 testing event. Shihan Ormaza will be our Guest Master Instructor, and will be conducting a class for our students in the Black Belt ranks on Saturday morning. Shihan Ormaza is 40 years old, a 6th degree Black Belt in Kempo/Karate, was born in Colombia, South America and raised in New Jersey. He has been living in NC since 1996. 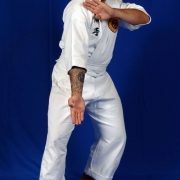 Shihan Ormaza has been married almost 18 years and is father to two boys aged 15 and 11. Shihan Ormaza began martial arts when his mother enrolled him at the age of 4. While he originally started it to learn self-control, he fell in love with martial arts and found it to be the perfect way to channel energy and aggression, and by the time he was a teenager, he knew that he would practice martial arts for the rest of his life. It was also during this time that Shihan Ormaza realized he had a passion for helping others reach their goals in martial arts. As a member of a Leadership Team, he was often tasked with helping to teach fundamentals to new students. The feeling he got in his heart after teaching them something or watching them progress, then passing a test, was amazing! It’s a feeling that still fuels his fire to this day. 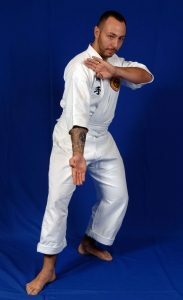 Shihan Ormaza was the first Martial Arts Instructor at the Gaston County College, in Dallas, NC. He has owned his own school, known as Ormaza Family Martial Arts, for 17 years and is very grateful for all the blessings that come with this responsibility. 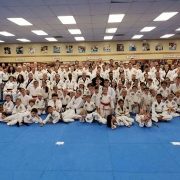 Currently, Shihan Ormaza is focused on developing his Leadership Team, which helps him manage over 40 classes every week. He is also very fond of Martial Science, so he dedicates a lot of time to developing a deeper understanding from both a modern western and traditional eastern point of view. This knowledge also helps him become a better Healing Artist, as enjoys healing friends and family through massage. 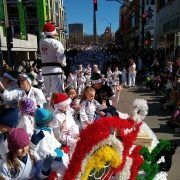 Above all, he derives the most joy from maximizing the potential of each student and helping them achieve balance in life through the practice of martial arts. Please join us in welcoming Shihan Ormaza as our featured Guest Master Instructor for our August 2018 testing! 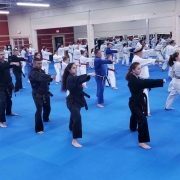 Asheville Sun Soo Martial Arts Had a Great June 2018 Testing! https://www.martialartsasheville.com/wp-content/uploads/2018/06/June-2018-Belt-Rank-Testing-Group-Photo.jpg 1166 2048 Ms Smith https://www.martialartsasheville.com/wp-content/uploads/2017/07/Logo-Dark-Background-300x198.png Ms Smith2018-06-16 11:59:252018-06-16 12:35:27Asheville Sun Soo Martial Arts Had a Great June 2018 Testing!